This chapter is not on the technology of Virtual Worlds. 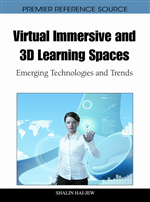 The authors discuss the application of a Virtual World as a teaching and learning environment for a course on Virtual Worlds. In their view, innovation and education should go hand in hand. Too often, new technologies are discussed without being applied. The authors argue that innovative technologies do belong in those classroom where their application is relevant to the topic. In thischapter, the authors discuss an example of how this issue can be tackled. They show that application of innovative tools is useful to all parties: students, lecturers and researchers, even if it raises new problems from which we all can learn. Virtual worlds with no preset narrative, such as Active Worlds or Second Life, are considered usable asset in education (Livingstone and Kemp 2006). The implementation of the learning environment in a virtual world is not necessarily successful. The “Virtual Worlds” course of the Digital Communication curriculum of the Hogeschool Utrecht (University of Applied Science, Utrecht, the Netherlands) combines traditional instructional methods (classroom setting) with a collective practical assignment in an Active Worlds world. Starting with the spring of 2008, the students are asked to build an application, consisting of 3D-model of a house and its surroundings, and to place it in a common village situated in an Active Worlds environment. Figure 1, as well as Figure 4 and 5, show examples of students’ work during the courses we analyzed. The complementary approach of the Virtual Worlds course works very well: collaboration continues naturally in both worlds, virtual and real (Benvenuti et. al, 2008). The spring 2008 edition of the course was very successful. The relation between the courses subject and the applied technology was a powerful combination. Other success factors might be the choice for an immersive collaborative structure, or the village metaphor. The question whether a virtual village is an appropriate tool to support a community of learners is not one-dimensional. Sense of community is a subjective concept. Some students consider participating in a community equivalent to sharing results with colleagues, others expect the results to be produced together. The same applies to learning: the students who pass an exam frequently don’t agree on what they have learned, nor on its significance. In 2008, we had investigated the students’ opinion about the way the course was taught and about their own attitude. Though the answers were obviously positive – the students stated having found themselves involved and participating in the learning community - we noticed a large variety of opinions on the usefulness and instructiveness of the collaboration in the virtual world.